If you had to go with the stereotypes, the answer would be a big “no”, as this one-of-a-kind Aegean gem is mostly linked with adult entertainment, such as wild partying, drinking, dancing till dawn. Especially during high season, Mykonos is considered to be a free, no-boundaries zone where (almost) everything is allowed and welcome. So, one might think that Mykonos is in no way a place for kids. Only that this is not true at all. Of course, the island is full of nightclubs and bars where celebrities from all around the world feel free to party in the craziest ways they choose; but this is just one side of this world-renowned destination. Next to breathtakingly beautiful beaches, like Paraga or Paradise, where the party starts early in the afternoon and escalates until early in the next morning, there are plenty of equally spectacular places ideal for families. Agios Ioannis, Platys Gialos, Agios Stefanos and many more beaches are perfect for an unforgettable family day by the sea. Here children can enjoy a great variety of exciting water sports and other activities, like skiing, snorkeling or even scuba diving, while their parents can quietly read their books or sunbathe. 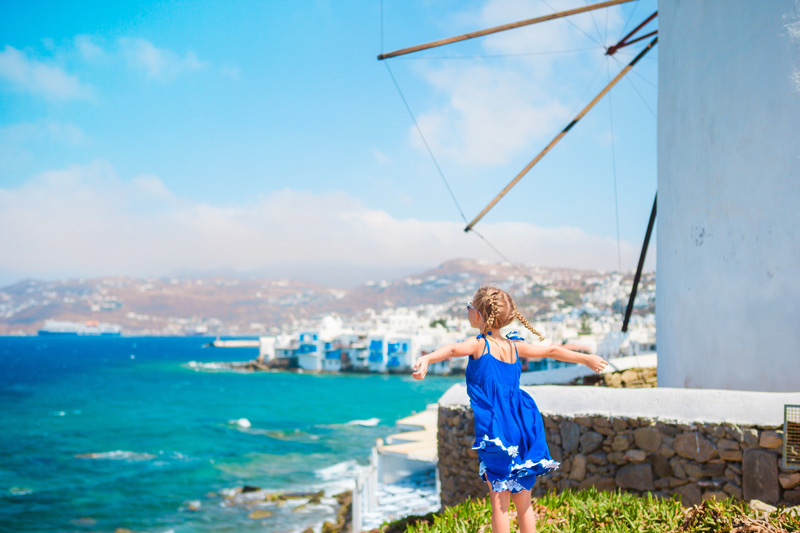 Yes, bring your kids to Mykonos! That’s right, just go ahead and take your kids with you. Let the young ones have the time of their life and then drive them downtown for a mouthwatering souvlaki; a typical Greek delicacy involving a crispy pie wrapped around juicy pieces of pork meat —or chicken— with tomato, onions, tzatziki sauce and French fries. Advise them to leave some room in their stomach for a super delicious and homemade ice cream or frozen yogurt and plan the most spectacular activities for the next days, like horse riding in the sunset or enjoying a special tour around the island on a sailing boat or a motor yacht. 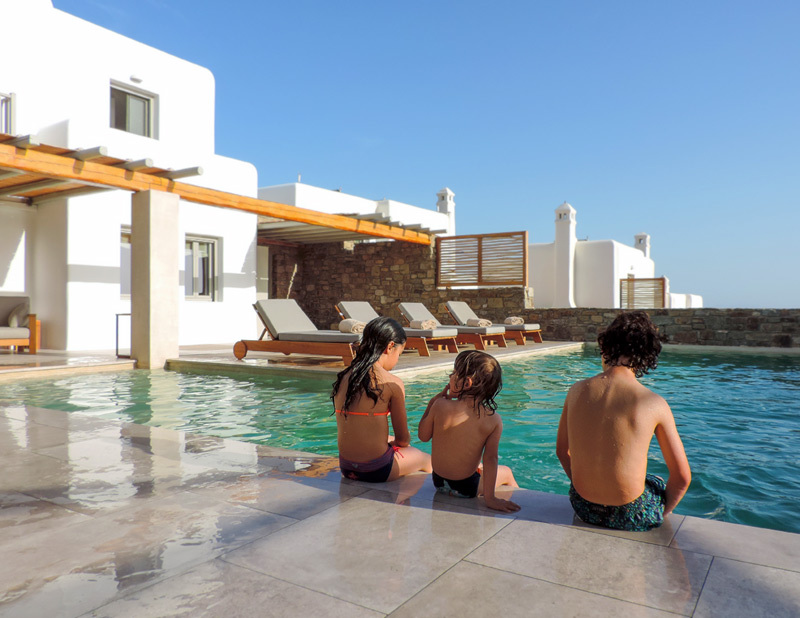 The best time of the year for a family holiday in Mykonos is in late spring (beware, though, as the sea is still cold) or in September which, according to many, is the most privileged month of the year. M-One villa can accommodate up to 9 guests offering relaxing family moments by the pool. Last but not least, keep in mind that at M Mykonos Villas we can always provide you with a qualified nanny who will take care of your little ones and set you free to take a walk on Mykonos’ wild side!